The first Point Arena Lighthouse was constructed in 1870. Its brick and mortar tower featured ornate iron balcony supports and a large Keeper residence with enough space to house four Light Keeper families. In April of 1906, a devastating earthquake struck the tower. Damage from the trembler occurred all along the San Andreas Fault, which runs very close to Point Arena. In the town itself, many buildings were reduced to rubble and at the Light Station the Keeper’s residence and Lighthouse were damaged so severely that they were rendered condemned, and ultimately torn down. The United States Lighthouse Service contracted with a San Francisco based company to build a new Lighthouse that could withstand any future earthquakes. The company built factory smokestacks, which accounts for the final design for the current Point Arena Lighthouse. The new design featured steel reinforcement rods encased in concrete, and was the first lighthouse to be built in this manner. 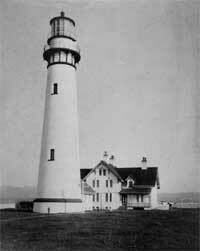 The new Lighthouse began operation on October 15, 1908, nearly 18 months after the quake. It stands 115 feet tall, and featured a 1st Order Fresnel Lens, over six feet in diameter and weighing 4,700 pounds. The lens is made up of 258 hand-ground glass prisms all focused toward three sets of double bulls eyes. It is these bulls eyes that gave the Point Arena Lighthouse its unique “light signature” of two flashes every six seconds. This incredible optic, that holds an appraised value of over $3.5 million, is set in solid brass framework and was built in France. Prior to the introduction of electricity, the lens was rotated by a clockwork mechanism. The Keepers, or “wickies” as they were called, had to hand crank a 160 pound weight up the center shaft of the lighthouse every 75 minutes to keep the lens turning. Light was produced by a “Funks” hydraulic oil lamp that needed to be refueled every four hours, and whose wicks would have to be trimmed regularly. Later, a 1,000 watt electric lamp was installed to replace the oil lamp and a 1/8 horsepower electric motor was installed to turn the gearset that rotated the lens. June of 1977 brought the installation of an automated aircraft-type beacon on the tower balcony, and use of the historic 1st Order Fresnel Lens was discontinued. The 400 pound aircraft beacon was later replaced by a 40 pound modern rotating light that incorporates the Fresnel principles for the efficient projection of light. This was replaced in 2015 by an 8 tier VLB-44 LED array. In addition, a radio beacon, with a 50 mile signal that originates from the station, also assists mariners. The oil lamp in the original 1870 tower was visible for approximately 18 miles, the 1st Order Fresnel Lens in the current tower for 21.5 nautical miles, the rotating light could be seen for 19 nautical miles and the current VLB-44 is visible from up to 14 nautical miles. In 1978, the fog signal at the station was silenced, and a bell buoy was placed nearby. In 1984, a nonprofit organization called the Point Arena Lighthouse Keepers, Inc. acquired the light station as part of a 25 year land lease from the Coast Guard and the Department of Transportation. In November of 2000, the nonprofit group became the official owners of the property due to their diligent historic preservation and educational efforts. Daily visitation, gift store sales, memberships and the rental of the historic Keeper’s homes on the property as vacation houses all provide desperately needed income for ongoing preservation, facility upgrades and educational endeavors. For more information on lighthouses around the world, contact The United States Lighthouse Society, located in San Francisco, California. To learn more about the Point Arena Lighthouse, click here!